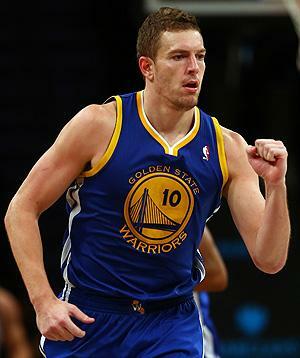 David Lee was born on 29 April 1983, in St. Louis, Missouri USA, and is a professional basketball player, best known for playing in the National Basketball Association (NBA) with the San Antonio Spurs; he has also played for the New York Knicks and Golden State Warriors. All of his efforts have helped put his net worth to where it is today. How rich is David Lee? As of mid-2016, sources estimate a net worth that is at $32 million, mostly earned through a successful career in professional basketball. He earns an annual salary of around $15 million and has signed high-value contracts throughout his career. He’s also achieved several awards, and as he continues his career it is expected that his net worth will increase. David attended John Burroughs School and learned how to be ambidextrous because he broke his left arm while playing. He was named a McDonald’s All American, and won the 2001 Slam Dunk Competition while in school. After matriculating, he attended the University of Florida and played with the Gators from 2001 to 2005. He was named to the All-Southeastern Conference as a freshman and would continuously improve throughout his time in the university. During his senior year, he joined Al Horford, Joakim Noah, and Corey Brewer to win the 2005 SEC Men’s Basketball Tournament. They defeated the Kentucky Wildcats and earned the Gators first championship from that tournament. Lee joined the 2005 NBA Draft and was the 30th overall pick by the New York Knicks. He became the starting forward of the team for 13 games and posted decent numbers in some of them; he averaged 5.1 points and 4.5 rebounds during his rookie season. With Channing Frye injured during the next year, Lee would become the starter; he was ejected during the 2006 Knicks-Nuggets brawl despite not actually participating in it. At the time All-Star week approached, he was first in shooting percentage and eighth in rebounds in the league. He was named as the MVP during the Rookie Challenge getting 30 points and a 100% shooting percentage from the field. Unfortunately, he was injured during one of the games in the season, and his minutes were significantly cut. He continued with good performances in the next two years, peaked by achieving 30 points and 20 rebounds in a career high game that rivaled Patrick Ewing’s Performance. He joined the 2010 NBA All-Star Game as a replacement to Allen Iverson, becoming the first Knick to make the All-Stars since 2001. He also recorded his first triple double during this season with 37 points, 20 rebounds, and 10 assists. After becoming a free agent, Lee was signed to the Knicks but was traded to the Golden State Warriors, with a $79.54 million contract over six years. He became a starter for the Warriors and helped the team with good numbers; he scored his second triple-double in 2012, with 25 points, 11 rebounds, and 10 assists. He continued to score well for the team and became part of the 2013 NBA All-Star Game. He performed consistently and led the league in double-doubles with 56. He helped the Warriors reach the playoffs against the Denver Nuggets but injured his hip during the fourth quarter of their first game. Despite the injury, he still played for the team, but they were eliminated by the San Antonio Spurs during the next round. In 2015, Lee had an injury-riddled season and was replaced by Draymond Green in the starting line-up, but he helped the Warriors win the 2015 NBA Finals against the Cleveland Cavaliers. He was traded to the Celtics in 2015, but was waived after a few games. He then signed with the Dallas Mavericks and would play for them during the remainder of the season, but injured his foot during the playoffs. In 2016, he signed with the San Antonio Spurs. For his personal life, there is no public information on any relationship. It is known that Lee is a Christian, and that he participates in various charity programs with other NBA players. One of his projects is the Hoops for St. Jude charity program. Who is Caroline Wozniacki’s NBA star fiance David Lee and when did WTA Finals tennis player split up with Rory McIlroy?